Russia’s new federal space program will allocate a whopping 321 billion rubles ($8.2 billion) to the development and utilization of the International Space Station, a byword for global space cooperation that Moscow threatened to abandon earlier this year over the crisis in Ukraine. OKA-T is a major addition to the space station proposed by Russian engineers early on in the ISS program, but so far unrealized. It will be used for special research that the current facilities aboard ISS cannot conduct, and will spend most of its time flying along side the space station, rather than docked to it. “The state is allocating very significant resources,” Rogozin said, apparently contradicting earlier remarks threatening the future of the ISS program — which, with 15 nations involved in its construction and operation, is the largest international cooperative project ever undertaken by nations in peacetime. In April, after the U.S. began sanctioning Russian officials and companies following Moscow’s annexation of Crimea, Rogozin said Russia would exit the ISS program in 2020, rejecting a proposal by the U.S. space agency, NASA, to extend the life of the orbital outpost to at least 2024. Russia was no longer interested in working with an “unreliable partner that politicizes everything,” he said in May. Although Rogozin himself tweeted the announcement late Tuesday, and expanded comments were carried widely in the Russian media, no mention was made of the threats to abandon ISS, and it remains unclear whether the 321 billion rubles allocated for the station is intended to finance operations through 2020 or beyond. Roscosmos said in a statement Wednesday that the government’s final approval of the proposed space plan was immanent, but made no mention of the ISS budget, instead focusing Moscow’s goal of landing men on the moon by 2030. 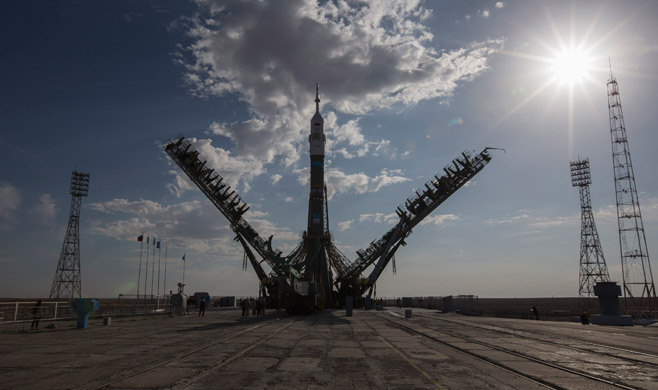 Leaked versions of the 2016-25 program have not contained a headline funding figure, but in April, Roscosmos announced $52 billion of spending through 2020 to revitalize a space industry that has stagnated since the fall of the Soviet Union. Proposals in the 2016-25 plan for projects such as a super-heavy rocket and lunar exploration missions have been reported in Russian media, but nothing has been said of the Kremlin’s long-term plans for ISS. Roscosmos has yet to formally reject or accept NASA’s proposal to extend the station’s life, but SpaceNews quoted Roscosmos’ ISS program manager as saying in July that the agency was waiting on approval from the Russian government and that the crisis in Ukraine was slowing the decision. Regardless, Rogozin — whose job is to lobby for the space and defense industries within the government — has quoted an ISS funding level that far exceeds what Russia has already spent on the project. According to data provided by Russian space industry analyst Pavel Luzin, adjusted for inflation, Russia has spent upward of 215 billion rubles on ISS between 2001 and 2012 — the period during which the station was gradually constructed. This averages about 18 billion rubles per year for most of the station’s lifetime. If the government approves 321 billion rubles to operate ISS through 2020 and then abandons the project, Roscosmos will spend almost 54 billion rubles for six years before leaving. Even if Russia stays in ISS and the program lives on to 2024, Rogozin’s number points to a massive budget hike for the program, with 32 billion spent annually. Russia does not currently have much in the way of additional construction planned for ISS at this point — Moscow expects to deliver its large and long overdue multipurpose science module Nauka by 2017, as well as two smaller modules and the OKA-T spacecraft, but those projects do not require funding on the scale Rogozin proposes. However, the Russian ISS program has a domestic reputation as being underutilized scientifically, and the spending could expand its use. The fate of the ISS program, and the vaunted U.S.-Russia space partnership by extension, is still in doubt.